The STS Team was called in to treat her, and after her first immobilization she stopped breathing. The attending veterinarian quickly reversed the immobilisation and we therefore had no time to treat the wound on her face. We went back after a few days, immobilised her again and this time she was stable. The STS Team under guidance of Dr Johan Marais proceeded to take radiographs, removed bone fragments and treated the infection. Thereafter he continued to dress the wound and applied the covering on the wound area that was pioneered by the STS Team. We left the dressing on for a total of 5 weeks, after which the team was again assisted by the attending veterinarian to immobilise her, so that the covering could be removed. However, she managed to elude the team and only after 2 hours of searching for her in the dense bush, we managed to dart her. On removal of the covering it was evident that the wound has healed very well, with very good granulation tissue and no infection present anymore. 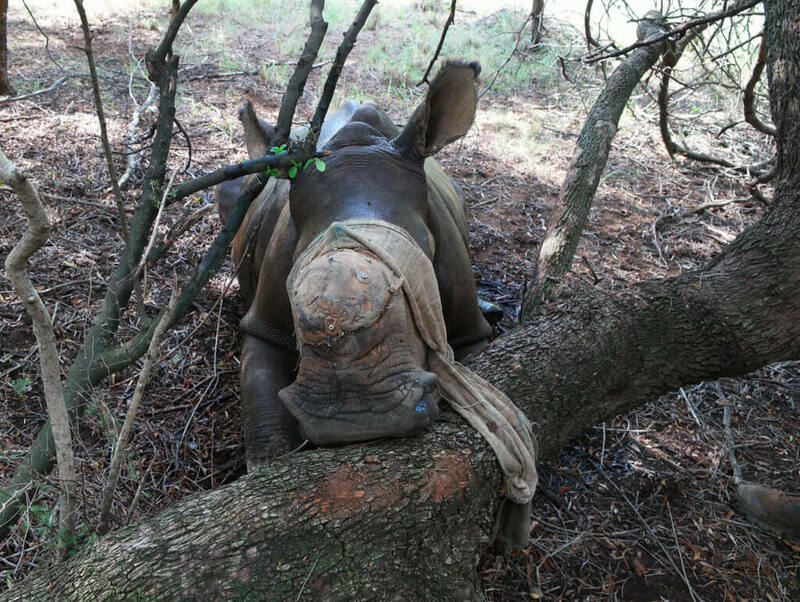 We decided to not apply a covering again in conjunction with the attending veterinarian, and she was woken up to roam freely in the reserve with the other rhinos.